New for September 2010! Dynamic range is the measurement of a receiver's ability to process a range of input powers from the antenna. If the signal is too weak, it can't be picked out from the noise, too large, and something starts causing spurs, or maybe saturation occurs. Dynamic range has the same meaning in audio. In orchestras there are passages of near-silence, along with passages of booming cannons, in the case of the 1812 Overture. Recording and reproducing wide dynamic range is a challenge. Sometimes a wide dynamic range is an annoyance. Did you ever try listening to a "book on tape" in a car on the highway? If the speaker's voice goes up and down in volume, you find yourself adjusting the speaker volume in order to boost the quiet passages above the wind, motor and tire noise, and reducing it when shouting starts in order to spare your ears. In this manner, you have have become a compander, mitigating the effects of a signal that has too much dynamic range for the channel (your ears). The word "compansion" is a portmanteau, a contraction of compression/expansion. This is equal to 2/3 of the range between the minimum detectable signal, and the third order intercept. Defined this way, the dynamic range is the area between the minimum detectable signal, and the point where the third-order product exceeds minimum detection level. 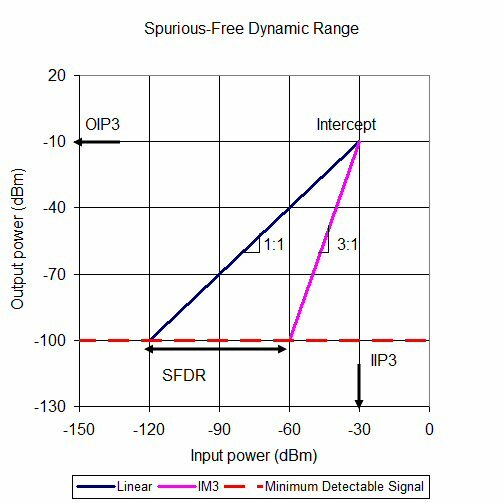 Here's something peculiar... if you worked really hard to improve the minimum detectable signal of your receiver, and improved it by nine dB, you only improve the SFDR by six dB! The linear dynamic range of a receiver is a measurement of the minimum detectable signal, to the maximum signal that will start to compress the receiver. Switchable attenuators can be used in front of the receiver to extend the dynamic range. However, this is at a cost of higher noise figure in the low gain state.